I have a question about the amount of stabilization to expect from a gimbal or unlocked ball head. In the past I have mostly shot hand-held. Occasionally I have used a tripod with the ball head completely locked down and with remote shutter release. I am now interested in using a tripod with hands on camera to track slowly moving subjects. The most recent example was a duck swimming by. I’m not thinking birds-in-flight at this point! I recently experimented with this indoors at a distance of about 20 meters. Handholding a 400mm non-IS lens on a full frame camera my slowest shutter speed was 1/400 second. That produced sharp shots more than one-half the time. With my light “travel” tripod and ball head I could slow the shutter speed to about 1/100, or about 2 stops stabilization for equivalent results. With my heavy tripod and ball head I could go to 1/50 and still get about one-half of the shots sharp. How much stabilization should I expect if I really got in practice with this technique? I can understand that a gimbal makes it easier to track vertical movements. Does a gimbal vs ball head matter with regard to degree of stabilization? I think the gimbal vs ball-head is more about the size/weight of the lens/camera combination and less about the type of benefit you are talking about. I am not saying that you wouldn't benefit at all from a gimbal. At least my understanding, a gimbal changes the center point of the weight from being at the very pinnacle/top of a tripod to being a bit lower and closer to the base. That position is inherently more stable. That position of great stability is most critical so that you lens doesn't flop to the side and everything falls over resulting in the worst day of photography ever. But it probably would have a slight effect also on your stability. Of course, a gimbal also does not allow for "roll" or side to side motion, where a ball head could roll or flop to the side. But that lack of "roll" would minimize movement in a direction, which would also help your stability. So, lower position closer to center, lack of roll, maybe another stop? Maybe down to 1/20-1/30 as a quick guess? BTW, while I have used gimbals, mine is on backorder so I do not have it yet. But hopefully in a week or so, I'll be able to test this for you if you are trying to make a decision. I am (mostly) a bird photographer and I use a Wimberly II Gimbal .... I have not experimented to see how many stops of stabilization it provides but it is so smooth and effortless to use with a big lens that I don't want to try a ball head. It also allows (via an accessory bracket and cable) for mounting a flash in a fixed position above and forward of it's usual position on the hot shoe. This is a big advantage for super-tele lenses. The Wimberly is built extremely well. Mine has worked flawlessly for over 10 years so far. I can think of one possible down side: a gimbal is heavier and bulkier. The amount of stabilization in most instances is not too important to me. I can seldom get a really sharp image with a shutter speed less than 1/320 because my primary subjects (small birds) are in motion too much. I think it matters quit a bit. I to have the Wimberly, and I have a Arca Swiss Z1. The Wimberly gives much better support than the ball head. When you free the ball head so you can move the lens, your hand has to support the lens, it can flop on you and you put out more effort than you will with a gimbal.. With the Wimberly if it is properly balanced you can move it with very little effort and it will stay in the position you set it without even locking it down. The less you have to support and touch the lens the greater improvement you will see. Claims to be able to get down to 1/15th second shutter speed with a gimbal and 600 mm lens, or a bit over 5 stop stabilization. Thanks for such prompt and helpful replies! Brant, thanks for the advice and the link. I had actually found that video, but wondered whether his numbers were representative of what others find. It seems a very helpful video overall. Joel, you make a great point. Very low shutter speeds are not likely to be useful for any real subject (rather than the label on an appliance I used as a test target). We should all think more in terms of the lower ISO that could be achieved. Shutter speed is really a convenient stand-in for lower ISO for these comparisons. Both HDNitehawk and Joel make the important point about how much the weight of the lens could matter. I am using the Canon 400mm f/5.6 and the 5DIV so total weight is not such an issue. I suppose that is the reason I can use a ball head at all. However I might sometimes rent a heavier lens. Then the ability to manage the weight better on the gimbal could be very important. And it certainly makes sense that if there is no strain on the hands to support weight in any direction that it would be easier to avoid shake with even a lighter lens. And HDNitehawk, very useful link. I did not really understand the vertical adjustment well until I saw this video. If I decide to buy a gimbal, I will be sure to post a follow-up here. I'm happy to give some follow up. Some readers of the forum may still wonder what to expect from a gimbal. In brief, it made shooting easier! I decided that the gimbal was a worthwhile investment. For my basement test at about 20 meters, with the 400mm F/5.6 on the 5DIV, I could get just about one-half of shots sharp at 1/25 second. That is about 4 stops total stabilization, one stop better than I could get with the ball head. The main reason seems to me the ergonomics. With the ball head I always had more tension in the hands. It still seemed psychologically necessary to “hold” the camera to prevent flopping around. That was with the best tension setting I could find, where the camera would not (usually) flop downward. With the gimbal my hands were better relaxed the whole time working to set up the shot. That included the time of shutter release. The relaxation led to a little less tremor. I have had one chance to use the gimbal for real. 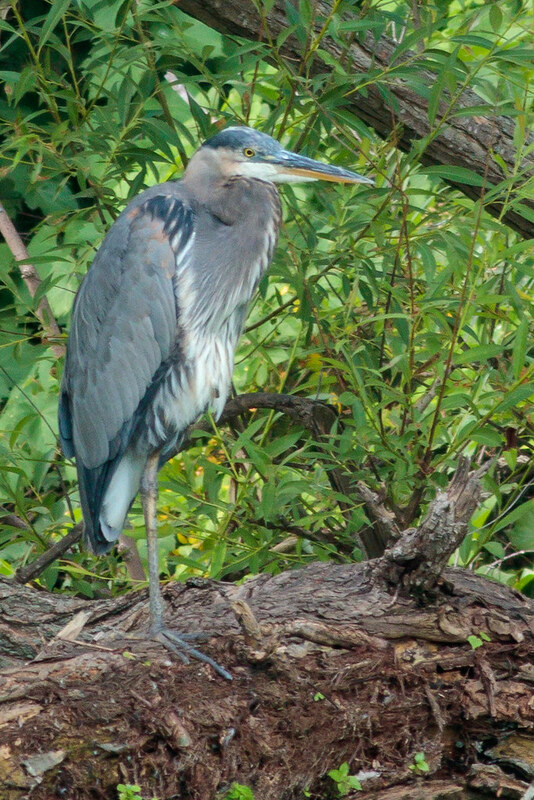 From midsummer through the fall there is usually a great blue heron hanging out at our nearby Quarton Lake. The favorite roosting place is naturally inaccessible by foot. Approach on the same bank as the heron gives only obstructed views until one would be too close for the heron’s comfort. That leads to shots across the lake, farther away than one would like. Still this seemed a good technical challenge for stabilizing a telephoto lens. I found the heron in his usual place last evening . I tried several different shutter speeds. I also was interested in comparing the my crop sensor SL2 camera to the full frame 5DIV on this mostly cloudy evening. Direct comparison of the gimbal to the ball head at the lake seemed less interesting, since I was convinced from the indoors tests that the gimbal performs better for me. Then rain showed up before I could try the ball head anyway! It was noticeably easier to get keepers with the gimbal than in prior years when I shot hand-held with an image-stabilized lens. For the following results I did not count the occasional shots that were not sharp because the autofocus locked on the foliage just behind the bird’s head. With the 5DIV and Canon 400mm f/5.6 plus the 1.4x teleconverter III. In terms of the image quality there were bigger differences from shot-to shot with one camera than the overall difference between cameras. The quality of the color seemed to me a touch better with the 5DIV. To be more specific about gear, I did not go for the apex with Wimberly and ArcaSwiss. For about two years I have used the Oben BC139 ball head, which Bryan had reviewed. It has performed well. This encouraged me to get the Oben GH-30 Gimbal. It has been very pleasant to use so far. It seems to have good fit and finish. There is some damping of the rotation for both panning and tilting, and these movements are very smooth. The vertical adjustment was slightly ratchety, but that is smoothing out with graphite lubricant and with use. I do not put a lot of wear on my gear, and I have not been using any lens heavier than the 70-200 f/2.8 II with teleconvertor. Heavy use and heavy lenses might make it better to choose gear from the top-of-the line manufacturers.